Krunal Pandya was another spinner to move up in the rankings. India spinner Kuldeep Yadav reaches career-best second position in the MRF Tyres ICC Men’s T20I Player Rankings; Tim Seifert, Beuran Hendricks, Shaheen Afridi also move up in latest rankings. 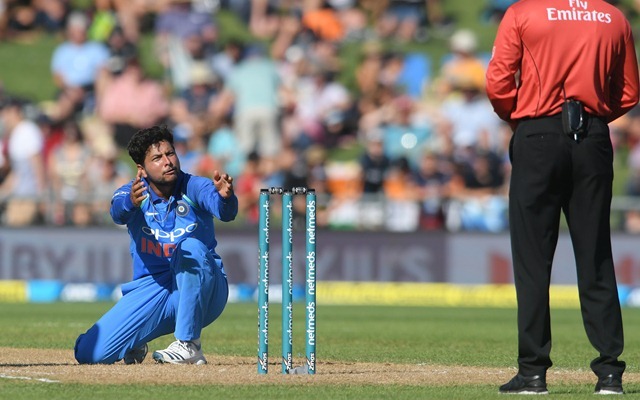 India spinner Kuldeep Yadav has moved up one place to take a career-best second position in the MRF Tyres ICC Men’s T20I Player Rankings after grabbing two for 26 in the final match against New Zealand which his side lost by four runs to go 2-1 down in the series. The 24-year-old left-arm wrist-spinner accounted for well-set openers Tim Seifert and Colin Munro in the only match he played during the series and reaped immediate dividends. He is now only behind Afghanistan leg-spinner Rashid Khan in the table. Left-arm spinner Krunal Pandya was another spinner to move up as he advanced 39 places to a career-best 58th while India openers Rohit Sharma (up three places to seventh) and Shikhar Dhawan (up one place to 11th) have made progress with some useful knocks. 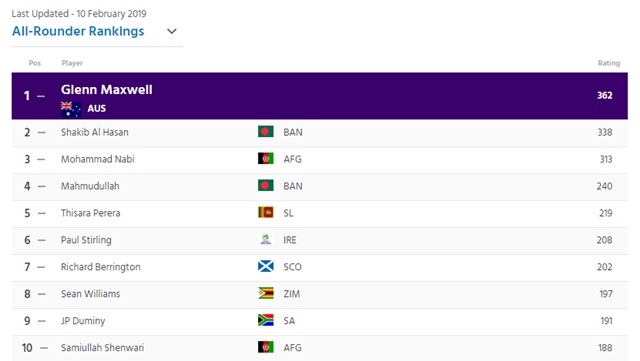 For South Africa, left-arm fast bowler Beuran Hendricks’s eight wickets against Pakistan have helped him re-enter the rankings at a career-best 81st position while his compatriot Chris Morris has gained seven slots to reach a career-best 21st position after finishing with six wickets. Andile Phehlukwayo has also advanced 15 places to a career-best 23rd position with five wickets. Among their batsmen, Faf du Plessis (up from 20th to 17th) and Reeza Hendricks (up from 73rdto 42nd) have been the main gainers. Pakistan’s Babar Azam continues at the top of the batsmen’s list after scoring 151 runs in the series while Hussain Talat has gained 19 places to reach 56th position after aggregating 98 runs. 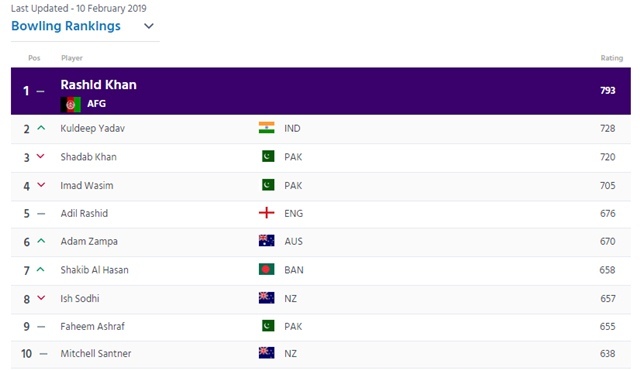 Shaheen Afridi has moved up 28 places to a career-best 48th position among bowlers. The UAE’s Shaiman Anwar has risen to 15th among batsmen with a gain of two slots while Mohammad Naveed has gained three places to reach 12th position among bowlers. 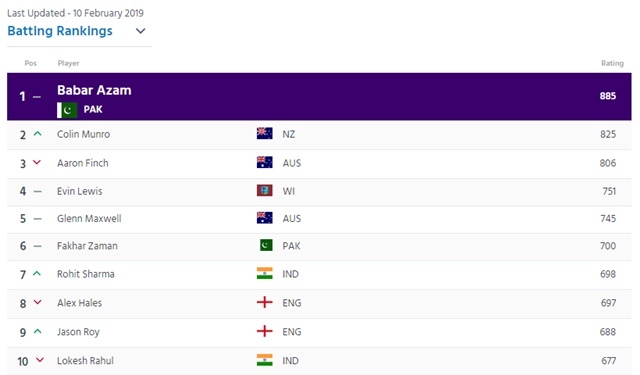 Nepal’s Paras Khadka has gained five places to reach 90th position while Basant Regmi (up four places) and Sompal Kami (up 22 places) are in joint 70th position among bowlers. 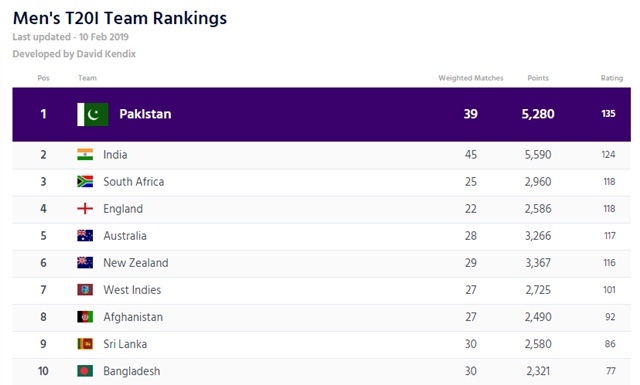 In the MRF Tyres ICC Men’s T20I Team Rankings, South Africa have overtaken Australia and England to third place while Nepal have overtaken the UAE marginally to be in 14th position even as they come on to the table within a week of similarly crossing the threshold of eight matches and gaining entry onto the ODI table.